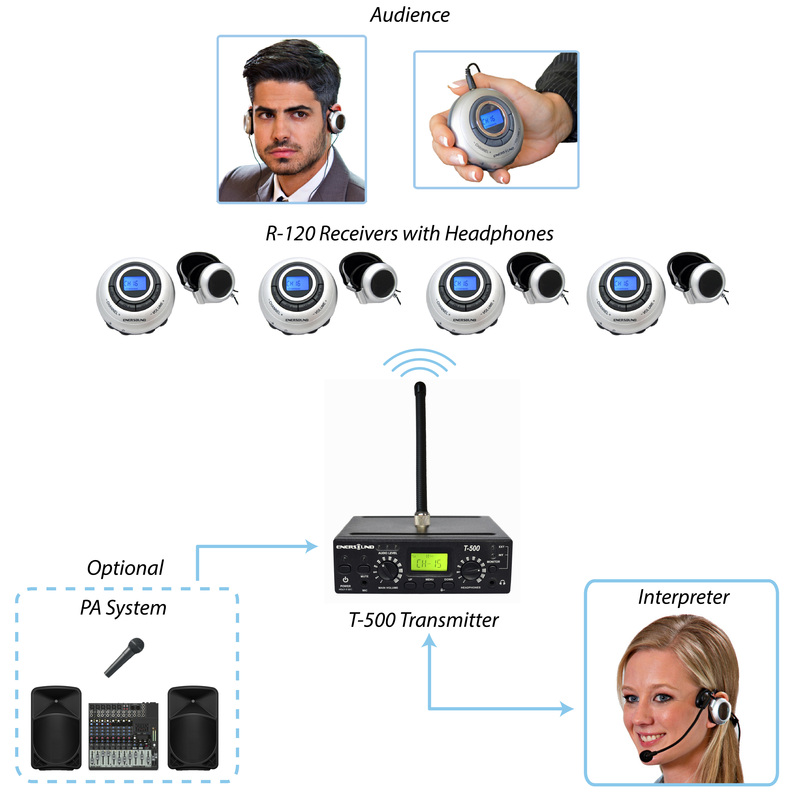 This 5-person Professional-grade Wireless Simultaneous Translation System provides superior sound quality and excellent coverage range, combining multiple-channel transmitter and receivers, as well as improved reliability and versatility. It can be expanded by adding an unlimited number of additional receivers. More foreign languages can be added for a maximum of 6 in the same room by purchasing 1 additional transmitter and microphone per language. Helpful, easy to use and affordable! We tried the system thinking about our small Spanish community and now we are receiving more and more Spanish speaking churchgoers because the word has spread around and they feel so blessed to be an active part of our service! It really paid off!!!! Strongly recommended! I don't know how you did it but the quality of sound is fabulous! Even those experienced sound engineers approved it. It's a very convenient package! If I think of all the advantages it offers there is no reason to doubt if you're deciding whether or not to spend your money.It pays off! This type of systems are sometimes seen as expensive for schools with a low budget like ours. It was part of our extensive PTA agenda and we decided to use part of our funds to purchase this system.These guys come up with this necessary yet affordable solution to let everybody feel included. We recently purchased 2 sets of this for our Spanish and Portuguese congregation. Feedback from users was excellent, and the coverage range is very good! Pros: large coverage range, ease of use, clear sound, small and light weight, wireless receivers. We had been looking for something like it,With the interpreter monitor the rest is simple.I just plug my headphone and the speaker's sound is so clear! No more background noise! We use it at school for our parent meetings and the Spanish families are very pleased with these receivers. It was so easy to set it all up and use it that I can't belive it's real! I purchased a package and the congregants in my church just loved it.The sound is amazing. Great for interpreters and for the audience as well! The audience can use their own headphones and the interpreters can press the mute button to sneeze and listen to the source language without an amplifier. We are very satisfied with this purchase!! Click the button below to add the 5-Person Translation System with Interpreter Monitor to your wish list.